Last month I took a week long trip to New Mexico. It was a bit of an artist retreat. Nothing inspires me more than travel: seeing things for the first time, learning about other people, histories, legends, and trying new foods. This trip had it all. 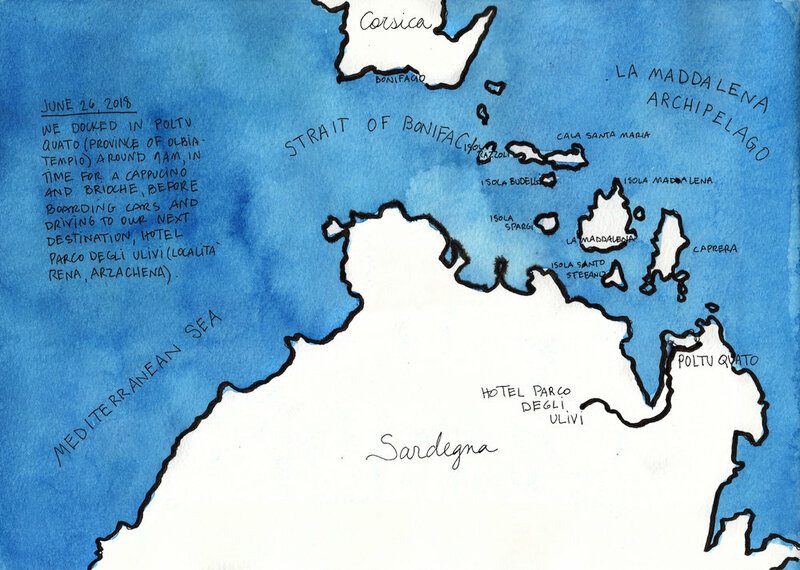 I start off my travel sketchbooks before I even leave home. This time, I began with a page outlining the itinerary and a short to do list to get ready for the trip. And I did a little homework to learn about New Mexico. I really enjoy doing this sort of studying before a trip. It adds dimension to my trips and to my sketchbooks. I landed at the Albuquerque International Sunport Airport and rented a car. I decided to drive the national scenic byway, the Turquoise Trail, to Santa Fe. Along the way, I had lunch in the artsy town of Madrid where the waitress suggested looking on the ground as we walked around. She said we would likely find turquoise. I was skeptical but she was right! There were little tiny pebbles of turquoise mixed in with the gravel. That was a bit of magic! 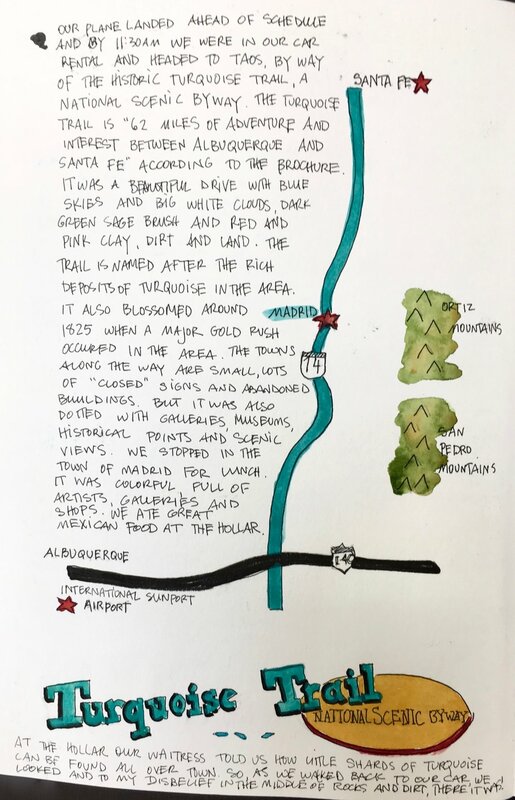 The Turquoise Trail ends at Santa Fe, a perfect stop on the way to Taos, my final destination. In Santa Fe, I explored the amazing galleries along Canyon Road. Arriving at Taos in the early evening, I was surprised by how small and lovely and inviting it was. Small shops, great restaurants, walkable, and interesting. Lots of galleries and museums and historical landmarks. On the way to Georgia O’Keeffe’s Ghost Ranch, I pulled over for the Classical Gas Museum. I loved all the old cars and trucks, old gas pumps, vintage diner, toys, signs… some rusted out, some cleaned up to a shiny new glow. Amazing! I took about one hundred photos and I’ll be painting a new series of Love of Americana from these objects. At the Ghost Ranch, I did the Walk in Georgia O’Keeffe’s Footsteps tour. It was fantastic! 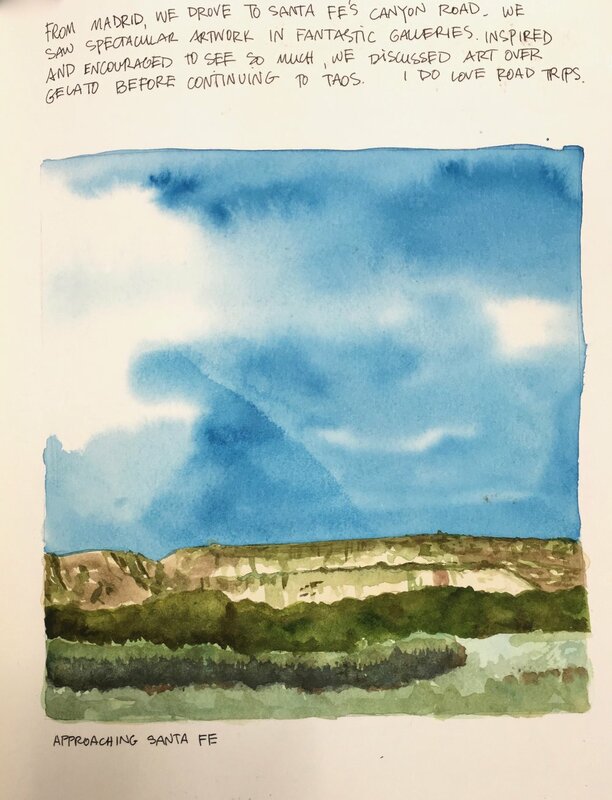 This walking tour takes guests to the restricted area of Ghost Ranch where O’Keeffe lived, painted and found inspiration. Our small group walked through what O’Keeffe called “her red hills” – the Chinle formation. Our guide was a great story teller while she showed us O’Keeffe’s painting sites by comparing prints of her paintings to the land forms around us. She also told us about the geology of the area, the High Desert (Upper Sonoran) flora and fauna and history of Ghost Ranch. Back in Santa Fe, I went to the O’Keeffe Museum and several more galleries. Art art art! My last sketchbook spread from this trip covers a great day spent at the New Mexico State Fair. Colors, rides, animals, dances, fair food. It had it all. Look for some paintings from this day too. 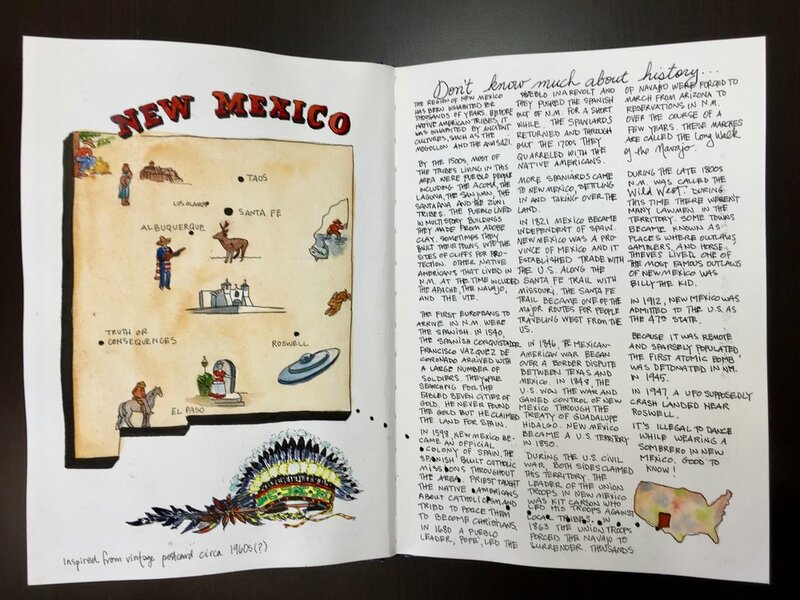 Thank you New Mexico for all the inspiration! (no class on December 26 and January 2) Cloud 9 Art School in Bothell. Learn about birds and how to paint them with convincing form and color. We will work from reference photos and explore the basics of bird anatomy, proportions and features. We will learn how to use the qualities of watercolors to create beautiful paintings. We will look at how to figure out which details to focus on and paint realistically and which features can be represented more loosely. My art school, Cloud 9, recently was awarded three national awards from a top parenting resource, Winnie, which features the best parent-approved places to play, eat and shop across the country. We are over the moon about these awards and recognition! Thank you! Cloud 9 was voted by parents as the Best Family Destination, the Best Educational Experience and the Best Birthday Party Venue in Bothell in this year's Winnie #FamilyFavorites awards! Parents are always looking for easy ways to do more as a family together, especially at places that welcome children, but these local spots aren't always easy to find. It’s so important to Cloud 9 to create a family-focused art school for our community. We offer art classes for pre-school, kids, teens and adults. Our teachers are all professional artists and we also have artists from across the US come and give workshops at Cloud 9. With kids back in school, it's great for local parents to have a short list of places they know are highly recommended. Do you have a high school or even a middle school artist who is considering going to art school? It’s not too early to start looking at what it takes because getting into a reputable art school is competitive. One of the most common mistakes art students make is that they underestimate how long it actually takes to put together a strong portfolio. A portfolio is a collection of an artist's best artwork that showcases the best work and experience, ideas and skills, ability and commitment as an artist. A year would be a good minimum amount of time to put together a strong portfolio. Here are some of the most important factors young artists need to take into consideration when it comes to preparing for art school application. Does the student already have an art school in mind? If so, they should get online and look at the portfolio requirements of the specific school(s) they are interested in because different schools have different requirements. Some art schools provide a very specific outline of what needs to be submitted while others are more generic. The other (more important) aspect is creating strong artwork. Every art school I researched prioritized strong drawing skills first, idea development and personal expression second. 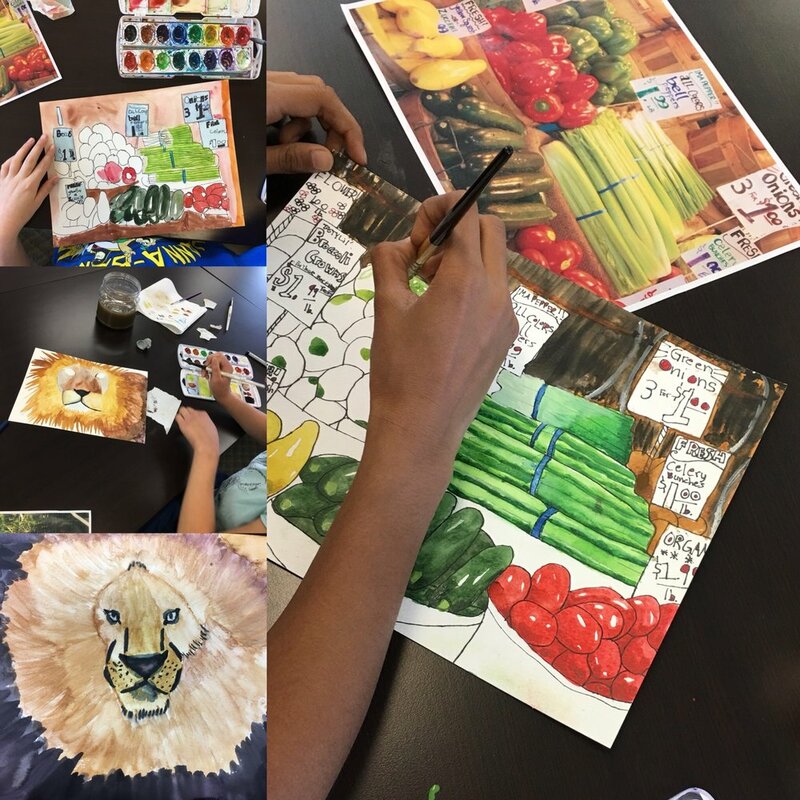 Strong skills in observational drawing and painting is the biggest factor that can help an artist get into their school of choice, whether an artist is applying for fine arts, design, or animation. A portfolio submitted for admission will usually consist of 10-20 digital images of a student’s best and most recent work so be selective! Each piece should showcase talent, ambition, commitment, and represent the student’s strongest capabilities. It is better to have 10 really strong pieces rather than 20 that aren’t one’s absolute best. Artwork should be photographed in good light and unframed. Work should be photographed and saved with high resolution so the reviewer can enlarge the images without pixilation. While it’s important to demonstrate good technical skills, a strong portfolio needs work that reflects thoughts, concepts, and personal work - not just class assignments. Schools want to see what speaks to the personal experiences and backgrounds of applicants. Keeping a sketchbook is important. It shows the process of an artist’s work, how ideas evolved, and how work has matured. Some art schools will require that applicant's submit their sketchbook along with the portfolio to give further insight. 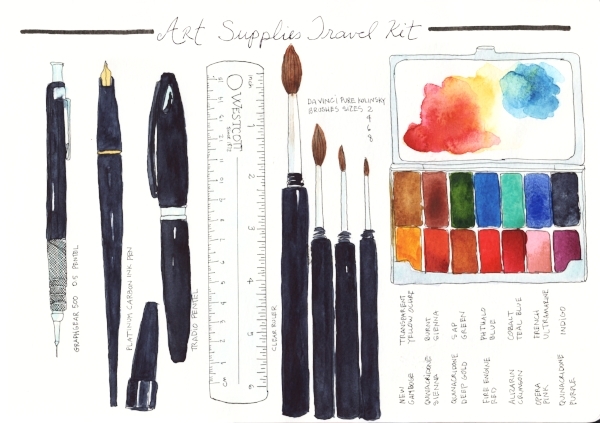 That aside, keeping a sketchbook will make students stronger artists! All artists need to learn how to talk about their work. Some art schools require an interview and mock interviews with a teacher can help prepare for the interview. Students should select a couple of pieces to prepare for the interview and get comfortable talking about their work (when and why they create the work, what the work is about, what media was used, and what they like about their work and why). Sometimes students can get their work reviewed by art professionals before applying to schools by attending a National Portfolio Day event where many art schools will have admissions officers available to review students' work, offer guidance and information about programs of study, admission requirements, scholarships, and financial aid. It seems like a lot to cover but starting early in the process will ensure that students have plenty of time and experience to pull together a strong portfolio, learn about the process, and get into the art school of their choice! This summer I had the trip of a lifetime, to Sardegna and then Verona. In Sardegna we spent five days on a sailboat, discovering the archipelago between Sardegna and Corsica. 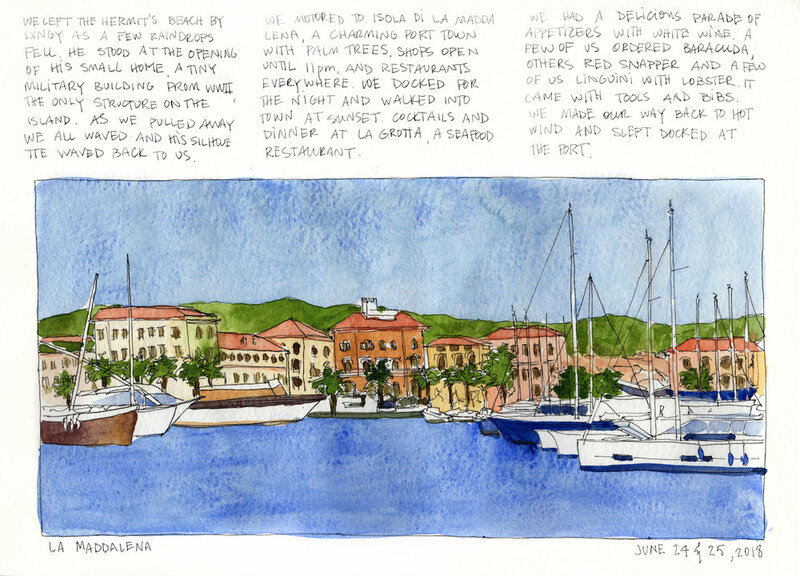 After sailing, we explored the interior of Sardegna, staying at an amazing hotel, Parco degli Ulivi. There is something exhilirating and soul satisfying about seeing a place for the first time. New things to see and feel, smell and taste. New music, new people. This trip had all of that. And it inspired me on every level. 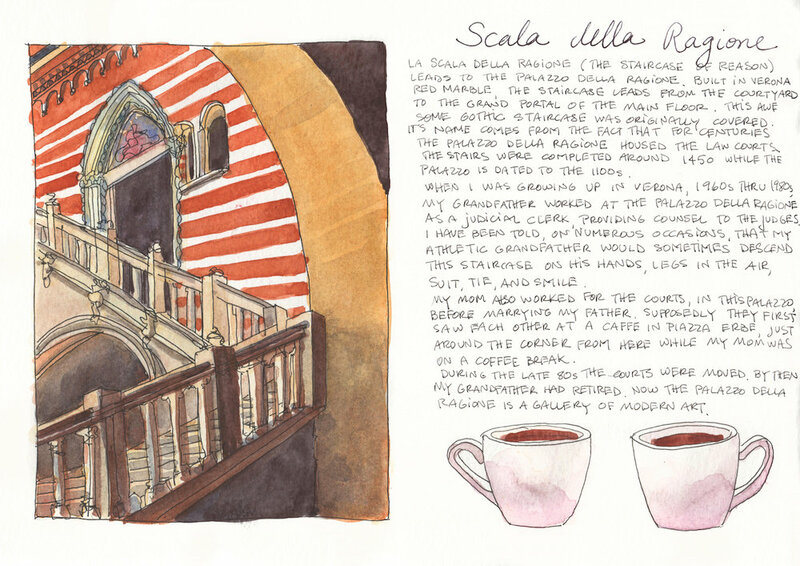 If you would like to see all the pages from this travel sketchbook, click here. I do hope you enjoy. There is great inspiration that comes from traveling. Seeing new lands, faces, traditions, and histories fills my heart and mind, makes my world bigger, inspires my art. I have just returned from a week in New Mexico. Most of my time was spent in Taos, Santa Fe and Albuquerque and I drove between these cities several times. I do love a road trip! Here is some of the awesomeness I took in. I feel a whole new series of paintings bubbling up! I've been invited to speak at the next meeting of the Evergreen Association of Fine Arts. 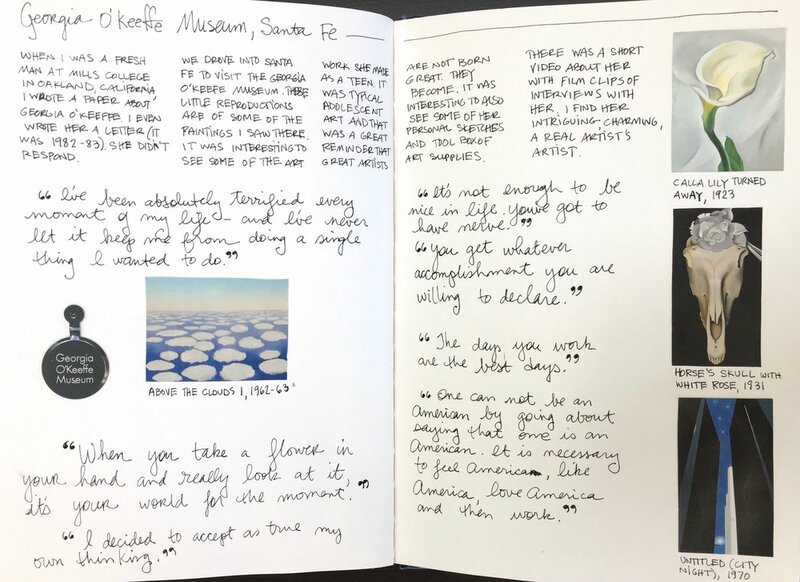 My presentation will be about sketch booking: every day sketchbooks, travel sketchbooks, the love of sketchbooks, sketchbooks, everything sketchbooks! The presentation will be on Thursday, September 20 at 2:30 until 3:30pm. I'm honored to be asked to be their speaker and hope you can attend! The Evergreen Association of Fine Arts (EAFA) is a volunteer, nonprofit visual arts organization that serves artists and communities throughout the Puget Sound region. They welcome visual artists in all media and levels of expertise. EAFA invites all artists to join them for these monthly meetings, for education and exhibition opportunities, and to be part of a community of fellow creatives. 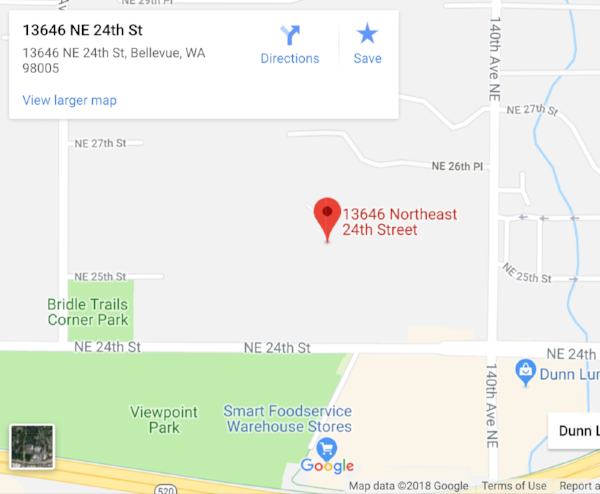 EAFA meetings are at Westminster Chapel, located in Bellevue, just west of 140th Ave NE, on NE 24th St. The meetings are free to attend and parking is free too. Win-win. Westminister Chapel is located at 13646 NE 24th St as shown on the map below. 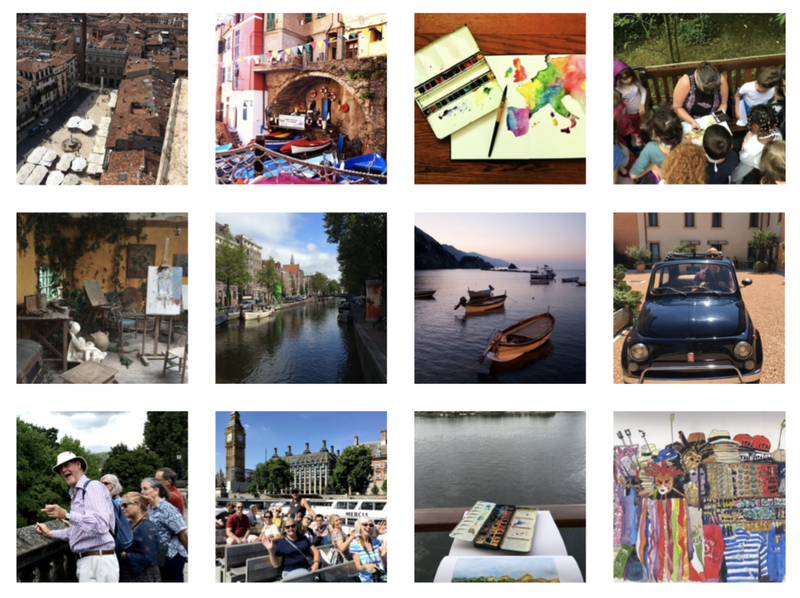 Are you ready to travel, sketch, and take in some of Italy’s top attractions for ten days?! 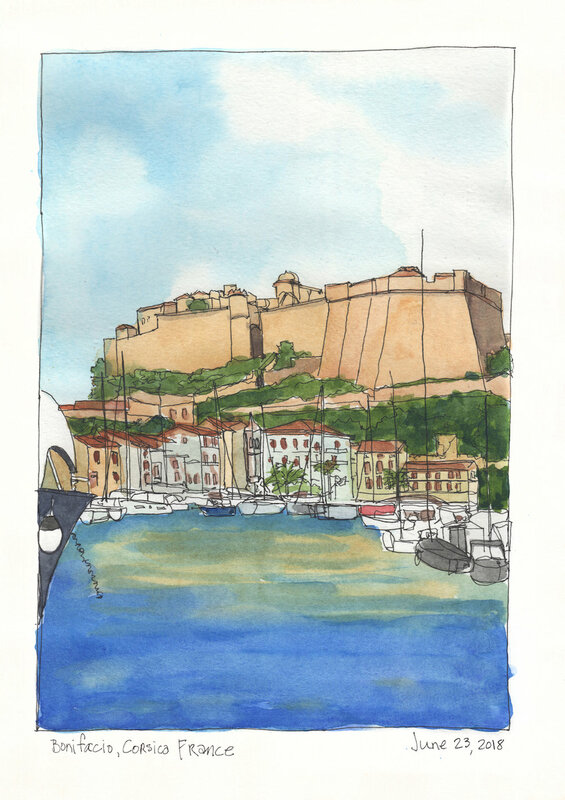 Sketchbooking workshops, lovely hotels, group tours and beauty everywhere. Come join me on a sketchbooking adventure. You can come to sketch and paint or come along just to enjoy the journey. With plenty of both group activities and time to explore on your own, we will have daily sketchbook workshops, daily breakfast at our hotels, walking tours, a few group dinners and countless amazing moments. Most afternoons and evenings will be yours to take in Florence, Siena and Cinque Terre at your leisure. 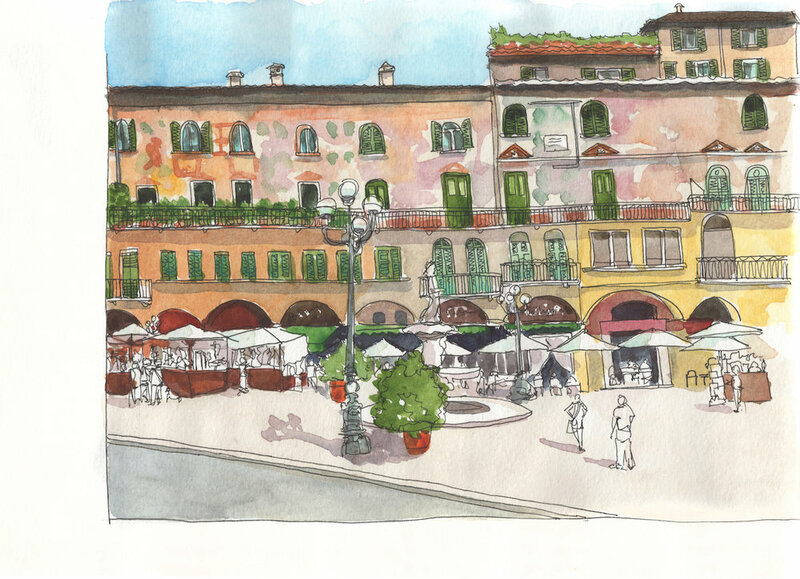 Included in this package are daily morning sketchbook workshops, lodging for ten nights in beautiful hotels (3 nights in Florence, 3 nights in Siena and 4 nights in Monterosso Cinque Terre), based on double occupancy, daily continental breakfasts, two group dinners, a cooking class, transportation to each city, two walking tours, a boat tour and entrance into museums. (round trip from your departure city to Italy) and meals not listed above. A commitment deposit of $750/person is due on December 15. For more information or to register for this inspiring adventure, contact me at charlene.freeman@me.com or For more info, click here. Space is limited so don’t wait to register! This summer I led a drawing camp for teens based on The Realism Challenge: Drawing and Painting Secrets from a Modern Master of Hyperrealism by Mark Crilley. We had a blast and the kids did some great drawings. We started off by drawing a torn piece of paper using graphite pencil and black and white color pencils. Some of the teens decided to make it more challenging by trying to capture the crumpled look of paper. 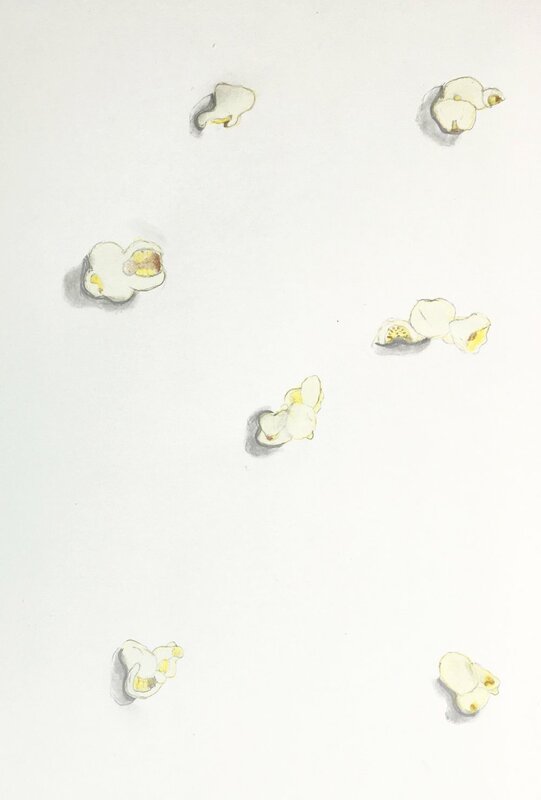 Next we drew popcorn. Each teen was given a bowl of popcorn and picked five or six pieces to draw. We used graphite pencil, a light wash of watercolors, and color pencils. 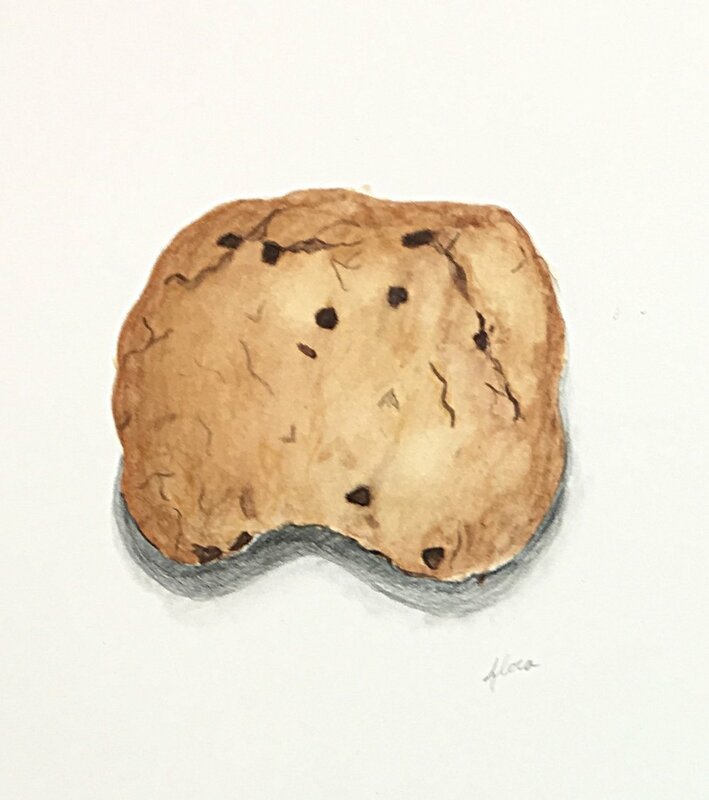 We moved on to capturing the details of a chocolate chip cookie with a bite taken out of it. We continued with graphite pencil, watercolors and color pencils. The subjects became increasingly difficult: string and marbles, shiny spoons, textured seashells, textured and shiny Twix bars, and lastly torn playing cards. All of these were drawn 1:1 scale with graphite pencil, color pencil and watercolors. I loved teaching this teen class. They were focused, fun, and look at these drawings! New Catalog of Art Classes & Workshops! The new catalog of workshops and classes at my art school, Cloud 9, is out. Check out all the great classes and workshops for kids, teens and adults: drawing, painting, sketching, printmaking, birthday parties and adult art parties. We have added new classes and new instructors! For a downloadable and printable copy of our latest catalog of classes, click here. I have an art exhibit opening on August 18 and you're invited! Please join me for the opening reception of Birds & Botanicals, a new series of watercolors and explorations into the beauty of our natural world. Located on the corner of Main Street & 101st Ave NE, in historic downtown Bothell. Admittance to the gallery is free and open to the public. I am both enthralled and comforted by the richness of every day scenes and moments. I am drawn to subjects which, through their ordinary and familiar qualities, take on a sense of beauty. Something catches my eye, something common, and in that moment it strikes me as extraordinary. There is great beauty in what surrounds us. In particular, nature continues to inspire me. My work focuses on the pauses between our words and the scenes between our actions, as these represent the threads that connect us. Here are my upcoming classes and workshops for adults. 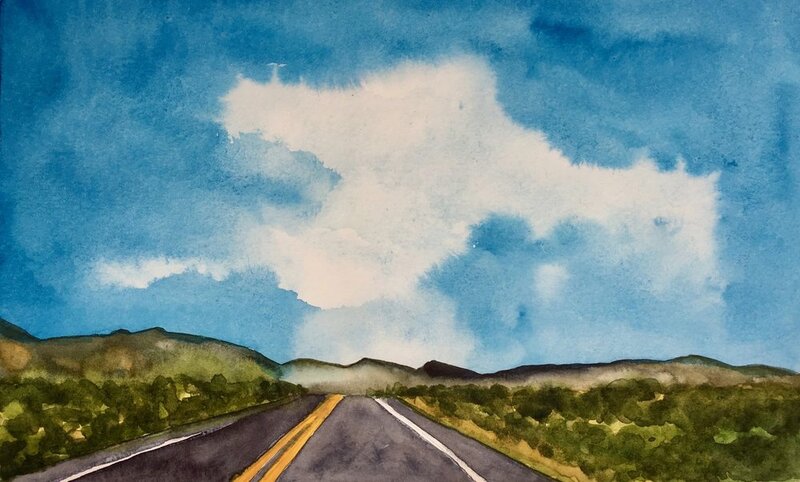 There are drawing classes, watercolor classes, and open studio classes during which you can work on your own projects. You can sign up month to month, stop and start as your schedule allows for open studio sessions. Come learn, be inspired and have fun! Register by clicking here! Fall art classes for kids and teens starting soon! Here are my ongoing classes for kids. These are weekly classes and run from September to June. You can sign up month to month, stop and start as your schedule allows. I recently ran a color pencils summer camp for 9 - 12 year olds. First they learned how to take care of their pencils, how to sharpen them properly, and how to create swatches of color that run smoothly from light to dark values for each hue. Their first drawing project was to create an abstract using a variety of colors with a variety of values. 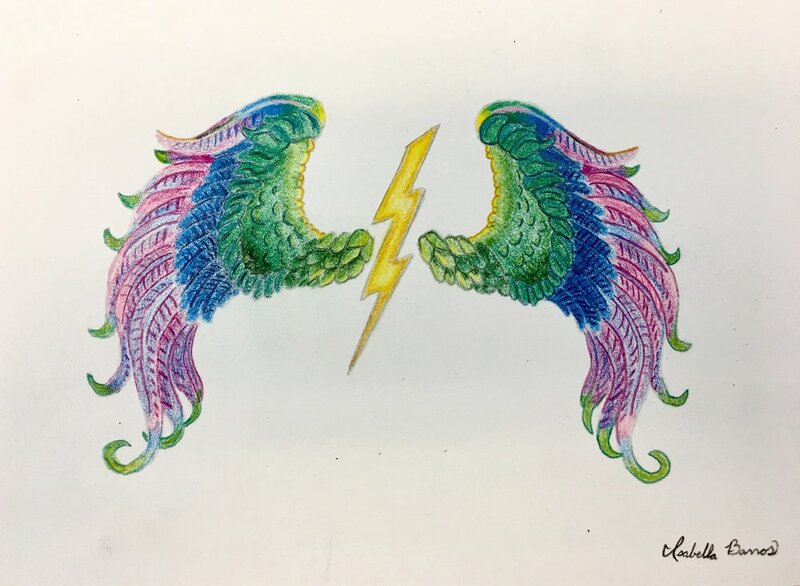 The second project was a to draw a thunderbolt with wings and color them in with a blending technique. 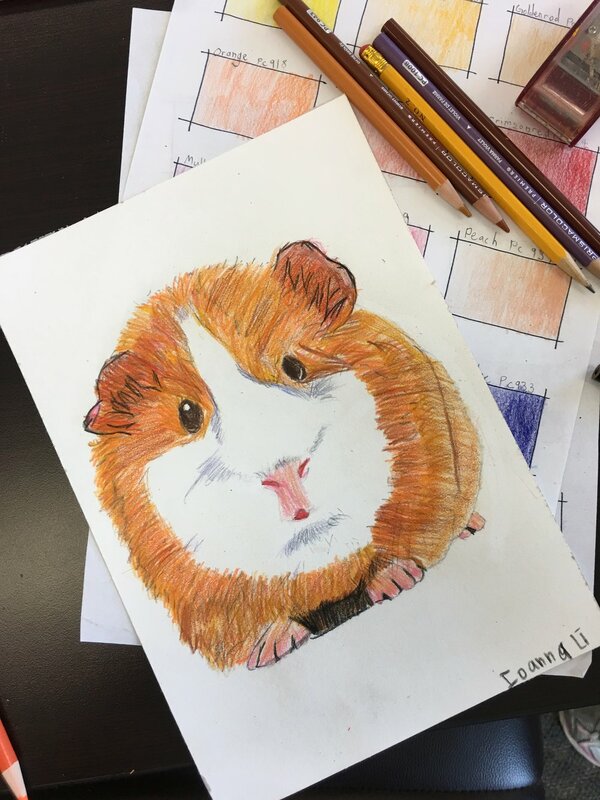 For the rest of our time together, the kids chose various projects from Eileen Sorg's book, Colored Pencil: Discover your "inner artist" as you learn to draw a range of popular subjects in colored pencil. They were very proud of their skills and artwork. As I was! My art school has been nominated as a top family destination! Cloud 9 Art School has been nominated as a top family destination in the 2018 Winnie Family Favorites awards! Thank you!! Winnie is where millions of moms & dads go to discover great family experiences. Please go vote for us! 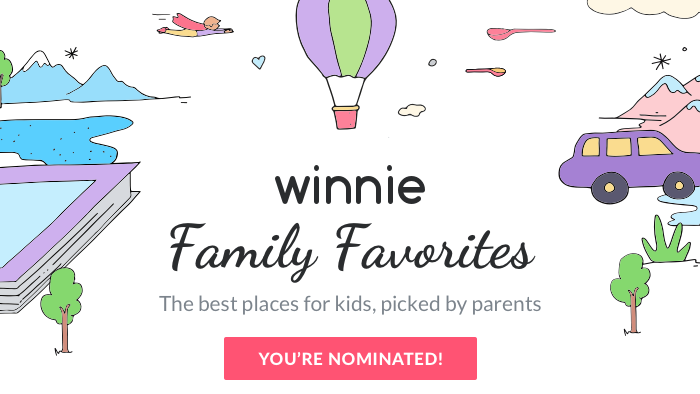 Voting is open now at winnie.com/family-favorites 👈 Once there you will see a lot of categories. Please vote for Cloud 9 Art School for the Live and Learn Award Category. You can vote every day for the same business until September 5. Which happens to be our one year anniversary. Coincidence? I think not! So please vote and vote often. Registration is not required to vote. Thank you for supporting us by casting your votes for Cloud 9 Art School. My art school, Cloud 9, has partnered with gofundme.com to raise money. Any amount donated is appreciated! Every $1000 raised buys a child or a teen a year of classes and art supplies! Every $500 raised buys an adult one workshop and art supplies. Scholarships will be awarded based on merit. Students will be able to submit images of their artwork and a short artist statement to apply for a scholarship. Please help us give the gift of art classes to students of all ages by visiting our donations page (https://www.gofundme.com/art-scholarships) and donating any amount. And please forward this email to other potential donors. Please help us give a year of art classes to as many aspiring artists as possible! I'm a big believer in the value of learning to draw well for all artists. Starting on August 27, I will be offering a Classical Drawing class for adults. You can sign up month to month and stop and start again as your schedule allows. Drawing classes will run August 27 through June. The classical way to learn how to draw realistically as it used to be taught in art academies and ateliers was based on first copying two dimensional references, then drawing from plaster casts, and finally, drawing from life. That's the method I will use in my Classical Drawing class for adults. Since the 19th century ateliers have often used drawings by Charles Bargue as the references to be copied. The lessons learned from the Bargue exercises extend far beyond learning how to draw. They teach greater skills, such as how to actively observe the world and how to complete a project with painstaking accuracy, leading students to become competent and confident in their work, whether that work is drawing, painting, or something else entirely. The Bargue Drawing method emphasizes copying the references as perfectly as possible. This teaches artists to see distances, lengths and angles as well as some seeing and depicting the light. The references are gorgeous and build up skills in a logical way. Below are some of the Charles Bargue images we will use in this drawing class. And here is the entire article that ran in The Drawing Magazine about this very method of learning to draw. To register for the class, just click here.